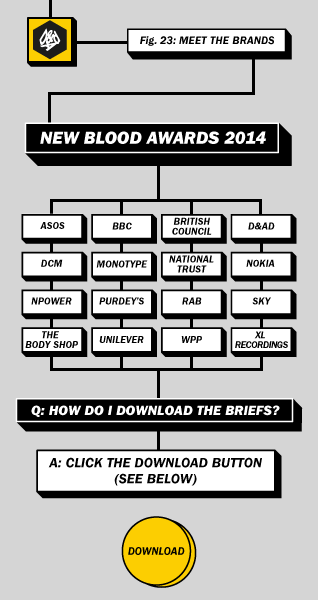 You’ve got until March 19 2014 to enter the D&AD New Blood Awards 2014. As you’ll deduce, the clock is ticking so if you’re in for the win, you know what to do. We’re looking forward to seeing all entries, and particularly our Tell Don’t Sell collaborative brief with D&AD. See our brief above or click the link for a full download. What? I never said we weren’t biased. Make Your Mark. Tell Don’t Sell. No sales pitch. No bulls*t. Just share your personal truth and we’ll see you at the finish line. Me and my friend Nejwa Jacobs just bumped into this post, and we’re so bummed we’ve already passed the Sign-up deadline! Is there any chance we can still participate?